In this video, Doug Clay continues his Monday morning devotional series. In this video, Dr. George O. Wood continues his devotional series on the Gospel of Mark. This episode focuses on Mark 10:24-25 and teaches that salvation is impossible unless the Lord makes it happen. Karl W. Giberson, The Wonder of the Universe: Hints of God in Our Fine-Tuned World (Downers Grove, IL: IVP Books, 2012). $16.00, 216 pages. Like many Christian ministers, I did not study science at the undergraduate or graduate level. Instead, I opted for philosophy and theology, academic disciplines which I felt would better prepare me for ministry. Thus, while I am not wholly ignorant of modern science, my understanding of it is admittedly thin. My conversations with ministerial colleagues indicate that this thin understanding is the rule among us, not the exception. Such a thin understanding of science is, it now seems to me, a hindrance to ministry in the modern world. While the most enduring objections to Christianity—the problem of evil, for example—do not arise from scientific inquiry, the most interesting ones today do: the origins of the universe (Big Bang cosmology) and the origin of the species (biological evolution). According to the so-called New Atheists, scientific explanations have displaced theological ones, so that God is a “failed hypothesis,” as the subtitle of a book by Victor J. Stenger puts it. One response to the scientific critique of Christian belief is simply to reject the science. This is the strategy of Young Earth Creationism and the Intelligent Design Movement, both of which reject biological evolution, although they disagree on cosmological issues such as the age of the universe and the Big Bang. These two responses are very prominent within North American Pentecostalism and evangelicalism. Another response—more commonly found among Christian academics and professional scientists than among laypeople—is to accept the scientific consensus on cosmology and biology but to reject the atheistic inference. This is the strategy of Karl W. Giberson in his new book, The Wonder of the Universe. Rather than dispute either Big Bang cosmology or biological evolution, Giberson argues that they may provide “hints of God in our fine-tuned world,” in the words of the subtitle of his book. From 1984 to 2011, Giberson was professor of physics at Eastern Nazarene College. In 2008, he became president of the BioLogos Foundation, “a community of evangelical Christians committed to exploring and celebrating the compatibility of evolutionary creation and biblical faith.” He currently directs the Science & Religion Writing Workshop at Gordon College. Whether you ultimately agree with Giberson’s scientific conclusions on cosmology and biology, you will find that The Wonder of the Universe is an accessible introduction to mainstream cosmology, and thus a partial remedy to a thin science education. You might also find that the atheistic inference from science is not as strong as New Atheists say it is. In this video, focusing on 2 Samuel, Doug Clay talks about relevant issues to be learned about sin from the life of David. 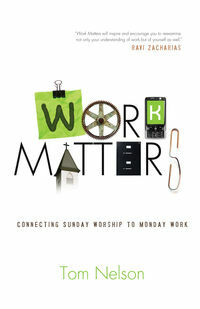 Tom Nelson, Work Matters: Connecting Sunday Worship to Monday Work (Wheaton, IL: Crossway, 2011). $15.99, 224 pages. In the late 1990s, I took a two-year hiatus from pastoral ministry to work in corporate America. My experience there shaped the way I think about Christian vocation. It taught me that the pastoral vocation was but one of many Christian vocations. Its purpose was to help people respond to both their primary vocation (faith in Jesus Christ for salvation) and their secondary vocation (faithful presence in the workaday world). Tom Nelson’s Work Matters is an insightful treatment of how Christians’ primary vocation affects their secondary vocation. The book grounds its treatment of the subject in the biblical categories of creation, fall, redemption, and glorification (chapters 1–4). Based on that foundation, it then examines practical issues such as dealing with the ordinariness of work, how work shapes us, working for the common good, vocational giftedness, workplace integrity, and the church’s role in shaping good workers (chapters 5–10). In each chapter of this well-written book, Nelson moves seamlessly between biblical exposition, culturally relevant illustration, and practical application. Each chapter concludes with a personal testimony from a Christian worker explaining how their faith shapes what they do. Nelson is pastor of Christ Community Church in Leawood, Kansas, and author of Five Smooth Stones and Ekklesia. In Work Matters, he writes for Christian laypeople, not pastors, and each chapter includes discussion questions. I would recommend this book to adult Sunday school classes, small groups, and book clubs. Pastors might also consider using it as a resource for a preaching or teaching series on work. In this video, Dr. George O. Wood continues his devotional series on the Gospel of Mark. Here, he talks about the Rich Young Ruler, who chose wealth over significance.